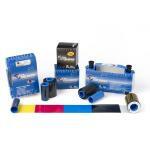 Zebra Laminate and Overlay Ribbons are only compatible with lamination ID Card Printers. The genuine Fargo Laminates help keep your organization more secure by keeping the ID Cards that you print hard to temper with and its anti counterfeiting measures. The Zebra Laminates also make your ID Cards more durable.